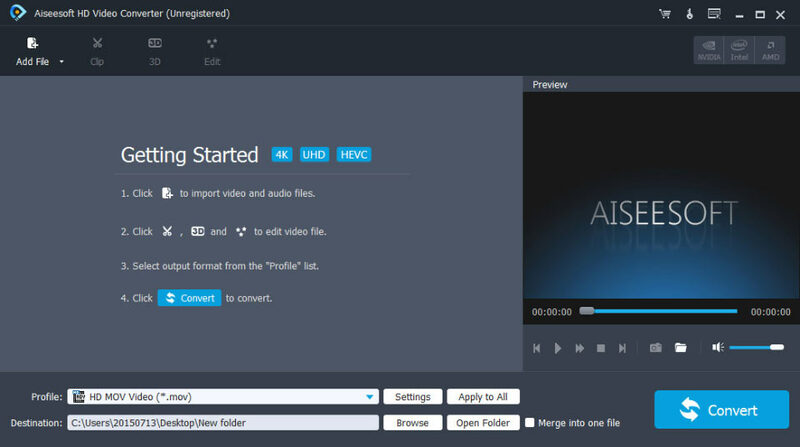 Aiseesoft HD Video Converter aims at converting HD video and other popular videos to any video(AMV, ASF, AVI, DivX, Flash H264, FLV, SWF, H.264 AVI, H.264/MPEG-4 AVC, MOV, MKV, M4V MPEG-4, MPEG-1, MPEG-2, MPEG-4, MTV, VOB, WMV, XviD, DV, VCD, WebM, HD) and audio(AAC, AC3, AMR, FLAC, M4A, MKA, MP2, MP3, OGG, WAV, WMA, AIFF, AU) format. Also you can use it to convert one audio to another. What's more,applying AMD APP and NVIDIA CUDA technology, it works much faster. And it also supports most popular portable devices, like iPhone 6s/6s Plus/5S/5C, iPad mini 3/2, iPad Air 2, HTC One X, HTC Butterfly, Samsung Galaxy S4, Samsung Galaxy Note 5, Kindle Fire HD, etc. This software highly supports iPhone 6s/6s Plus/5S/5C, iPad mini 3/2, iPad Air 2, iPod, Apple TV, Xiaomi, BlackBerry, Huawei, Motorola, LG, Sony Ericsson, HTC, Samsung, BlackBerry, etc.